Looks great! It says 4th quarter on the release of the Lane Gate - Pit Exit. Do you think the product will be released early 4th quarter? Thanks Brian. The "technology" isn't new and we've had Lane Gate sitting on the shelf for a year while we decided how to put it in the market. Not everyone has the tools or skills for soldering. Some products claim "no-soldering required" and would have you twist wires together. I don't consider that a proper secure connection: its a failure waiting to happen. Crimp splices are another way to go, but most people don't have a good crimping tool (the one from the local auto parts store is not good). When our new best friend Gary showed us Posi-Lock splice, we found the missing piece of the puzzle. The end result is that we can offer a product line that is easier to install and the installation will be highly reliable. I think Pit Lane exit units will be shipping in October. If you were desperate to have it in September, we should discuss by PM. Last edited by Earthbound; 08-20-2014, 02:41 PM. I used those to make the power tap on my old layout. They worked great. No, we needed something compact that would fit within the ~5mm space inside the track section. 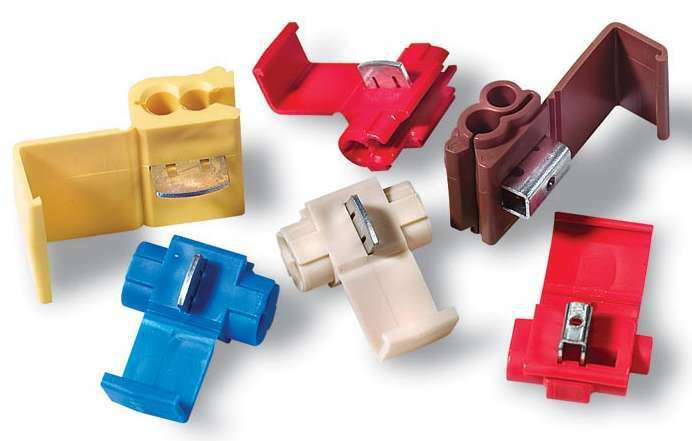 The Posi-Lock splice has the added feature of being removable/reusable. Last edited by Earthbound; 08-20-2014, 02:40 PM. One thing you may have noticed is that we color-coded all of our wiring to match the lane changer's own wiring. Makes the correct connections more recognizable. And if something doesn't look right or you need clarification, we're right here to answer any questions. Ah, ok, Posi-TAPs... I saw those when I googled Posi-Splice, but nothing came up with the name of Posi-Splice. The tap things look interesting. I hope they work well. I'll remember them if/when I have to do something with wire tapping. Not Posi-Tap, which is a related but different product: Posi-Tap functions like the taps in the picture you posted. The splice is called Posi-Lock. They're the bee's knees. I might have mistakenly called them Posi-Splice a few dozen times in the support documents, but you'll forgive me. Yes, it is easy to add a switch to defeat it whenever you want. I'll write up the details and have Monte add it to the support documents. Just out of curiousity Eman, why would you want to turn them off? My buddy and I normally race together and we don't need them. I need them for running by myself with ghosts or when rookie drivers / kids come over. I just thought if I do want to turn them off for any reason, now is the time to install the switchs while the soldering iron is hot. With the size of the layout I will be building soon, 36x16, I am pretty sure we won't turn them off once built. The building won't be finished for several months though, 90x46, so just trying to plan for everything. Guess it was a dumb question? Lol. Leave it to a guy who likes to bang on things.. I meant guess MINE was a dumb question. Not yours!!! There are no dumb questions here. Though I have been known to offer some pretty idiotic replies on occasion. All times are GMT-8. This page was generated at 01:32 PM.